Perhaps it was poetic providence that brought the Laudate Singers’ Winter Light concert to St. Andrew’s United Church on the night of Vancouver’s first snowfall of the season on Saturday (25 November). It was snowing outside, but inside, it was filled with the magnificent sounds of the Laudate Singers. Lars Kaario, their director and conductor, coaxed some of the best choral music heard on Vancouver’s North Shore from this local choir with exhilarating ensemble, amazing clarity, and superb balance throughout. The concert began with choir members lighting a series of candles that would essentially provide the only light in the church. From the rear balcony section, the singers delivered an Amy Stephen’s composition, Soul’s Journey, with the composer sensitively accompanying the choir on penny whistle. This was followed by an antiphonal performance of Miserere Miseris before the performers moved to the front of the church. The 16th Century Gaudete (Rejoice) was likely the best known medieval piece on the concert programme. It’s a stimulating piece containing some strong unison sections that made telling use of the singers’ rhythmic energy. After a 30-minute intermission where the audience was invited to the church basement to join the performers in refreshments, the ensemble returned with a premiere performance of bass singer Bruce Sled’s composition, Sparrow’s Jigs. As its title would suggest, it’s a lively dance-like tune inspired by Celtic folk music. Strawberry blonde and fresh-faced Amy Stephen is a multi-faceted performer who has toured internationally, playing festivals and concerts in Europe and Asia. While she has proven her versatility with fusion bands like Mad Pudding and Jou Tou, her roots are predominantly in traditional Celtic music. Her eclectic style blended perfectly with the Laudate Singers’ repertoire. Her second half solo set, accompanied by Michael Viens on the bodhran (an Irish percussion instrument), included the traditional Greensleeves and Carrickfergus as well as her own recent composition, Punjabi Market. 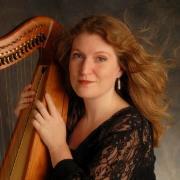 The selection exposed the audience to not only Ms Stephen’s pleasant voice, but also the piquant tone of the Celtic harp – the Celtic harp has a brighter pitch than the larger pedal harp. In the twenty-two songs performed, some sung in Latin, some in Gaelic, some even in English, there were some effecting moments, many of these coming from the singers' musical understanding and cohesive balance. The Laudate Singers will repeat the performance in a concert at St’ David’s United Church, West Vancouver on 15 December and there will also be a free Christmas concert on the 17th at St. Andrew’s United Church.